Pickleball vs. Paddleball vs. Padel | What's the Difference? Pickleball vs. Paddleball vs. Padel | What’s the Difference? In any given park or sports complex in America, you’ll find groups of people playing all manner of paddle or racket sports. Tennis and racquetball are two of the most popular of this variety of sport, but they offer only a taste of the creative options that are available. Of the sports that are growing in popularity, Pickleball and Paddleball are probably the ones getting the most press. You have likely heard of one or the other, or both, but you may not know much about them. Here, we will explore each sport and delve into what makes them unique and fun to play. Probably the most oddly named sport you will ever love playing, Pickleball was recognized as the fastest growing sport in America just a few years ago. Though you may have only just learned of the game, it has actually existed since 1965 when three dads in Washington invented it as a diversion for their families. Originally created as an alternative to Badminton, Pickleball is still played on a court roughly the size of a Badminton court. Whereas the net in Badminton is elevated, a Pickleball net is suspended just above the ground as it would be on a tennis court. A match is played with solid wooden paddles and a perforated plastic ball. Pickleball can be played indoors or outdoors and mixes the rules of tennis, ping-pong, and volleyball. It can be played as singles or doubles, with only the serving team being able to score a point. A game is played to 11 and the victor must win by at least two points. In the last decade, the sport has grown in popularity with the official number of players in the United States, as of 2015, is 2.5 million people. Official Pickleball courts can be found in every U.S. state, with over 3,000 courts throughout the country, and the sport is gaining fans in Canada, Europe, and Asia. In America, Pickleball is regulated and promoted by the USA Pickleball Association (USAPA). It is quite possible that you and your neighbor each play a game that you respectively refer to as “Paddleball.” It is also just as possible that you and your neighbor are talking about two different games when you do. 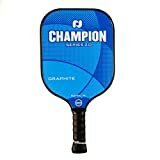 That is because, of all the officially recognized sports in the world, there are at least two different sports officially called Paddleball, and another called Padel (Pádel in Spanish) that is often referred to, by English speakers, as paddleball. The first version of Paddleball is one that involves two or four players hitting a ball off of a single wall. This game evolved from traditional handball and is played with a rubber ball and wooden (or, now, graphite) paddles. Like Pickleball, only the serving player or team can score a point. The court is 34’x20’ and includes a “short line” (16’ from the wall), a “long line” (34’ from the wall), and a “service line” on the right side of the court, halfway between the short and long lines (the server stands in front of the service line). Games are played to 15, 21, or 25 points. The United States Paddleball Association (USPA) is the official organization that regulates and promotes One-Wall Paddleball. Though the sport has existed since the 1950s and is growing in popularity, it does not enjoy the national recognition of Pickleball. This is perhaps because of its ambiguous name, or perhaps it is because it evolved from an already existing sport. Like its single-walled brethren, Four-Wall Paddleball is played in singles or doubles. Unlike the former version of the sport, though, this sport requires an enclosed space, including a ceiling. The court is 40’x20’ with the front wall and side walls being 20’ high. The back wall must be at least 12’ tall. The court is split into different zones. The first extends 15’ from the front wall. Beyond that is the 5’ “service zone,” which includes 18” wide “service boxes” on each side. Behind the service zone is another 20’ zone with a receiving line 5’ behind the service zone that runs from one side to the other. The rules of the game are the same as indoor racquetball. 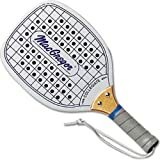 The game is played with a racquetball but the racket is a wooden paddle, similar to those used in One-Wall Paddleball. The National Paddleball Association (NPA) oversees the sport in America and provides all the official rules on its website. The sport is most popular in Michigan and Wisconsin. Though the game of Pádel originated in Mexico as an adaptation of tennis (which is why it is also known as “padel tennis”), it has become very popular in Europe, especially Spain, as well as many other Spanish-language and Arabic countries. The game is played on an enclosed court (similar to Four-Wall Paddleball) that is a third to a half the size of a tennis court. Unlike the other two varieties of Paddleball that we have discussed, the Padel court is split by a net (like in tennis) and the opposing teams face each other on opposite sides. The game is scored the same as tennis (using the same numbers) and is played in sets, but the gameplay is more like squash in which the ball is played off all four surrounding walls. The paddles are made of solid foam-like ethylene-vinyl acetate and must be perforated with holes. The balls used in Pádel are very similar to tennis balls, to the untrained eye are very difficult to distinguish. Padel is by far the most popular of the three Paddleball variations and is even more popular than Pickleball internationally. In America, the game is regulated by the United States Padel Association (USPA). If you’ve never seen Pádel being played, here are some highlights. Check out the first point where the player goes out the side door and returns it on the opposing court! Of the four games, One-Wall Paddleball is probably the easiest to play, if only because it only requires one solid surface and no net. Still, all four sports will be easy to pick up for anyone who has a history playing established games like tennis, badminton, or racquetball. As each sport becomes more popular and people continue to get creative with their athletic activities, it is likely that someday there will be even more varieties of each sport. There seems to be no end of activities that can be created with a couple of paddles and a ball. Get out there and play for yourself, and who knows, maybe one day you’ll invent your own internationally beloved sport. How Pickleball Helped Amy Lose OVER 100 Pounds!